Here I am. Back in Bangkok, Thailand. This time staying with a mate in the old town part of the city. Meaning no BTS sky train or MRT station nearby. The only way to get from our hotel to Downtown Bangkok with all the shopping malls (like MBK, Siam Paragon and others), are taxis. Unfortunately many Taxi drivers don’t speak English. 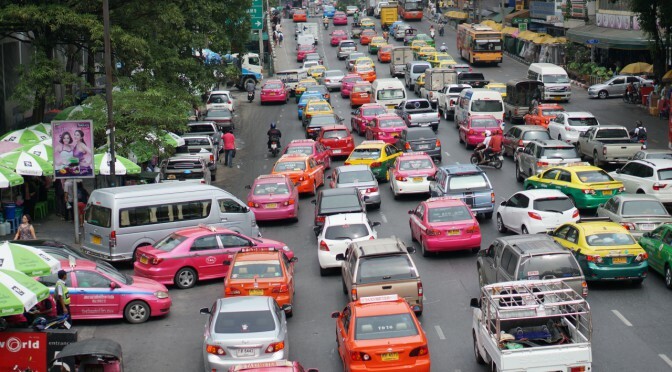 So I used the “Bangkok method” to get around. First look for a small business card of the hotel at the reception desk. This will later be important when you want to go back to the hotel. Most hotels can give you a business id card which contains the address of the hotel in Thai letters and/or a small map of where the hotel is located. DONT FORGET TO TAKE ONE BEFORE LEAVING. When you arrive at your destination round up the price to the next 5 or 10 baht. The drivers often dont have change and apprechiate a small tip. Hailing a taxi on the street is an almost impossible mission. Here’s the easy way: Just go to the next shopping mall. Most shopping malls have a so called “taxi queue” or taxi stand at the ground level. When arrive at the front of the line give the taxi coordinator the card from your hotel. He will then ask all taxi (or tuk tuk) drivers nearby if anyone wants to take you to your destination. Jump into the one the he/she points at. Other drivers may try to pursway you by smiling or winking at you to take their taxi/tuktuk instead. Be careful this could lead to either a very expensive ride or a trip to an unknown destination. After entering the taxi handover the card from the hotel to confirm your driver got the right address and double-check that he/she turned on the meter. Double-check that you have all belongigs before leaving the car. Getting it back is an impossible mission. 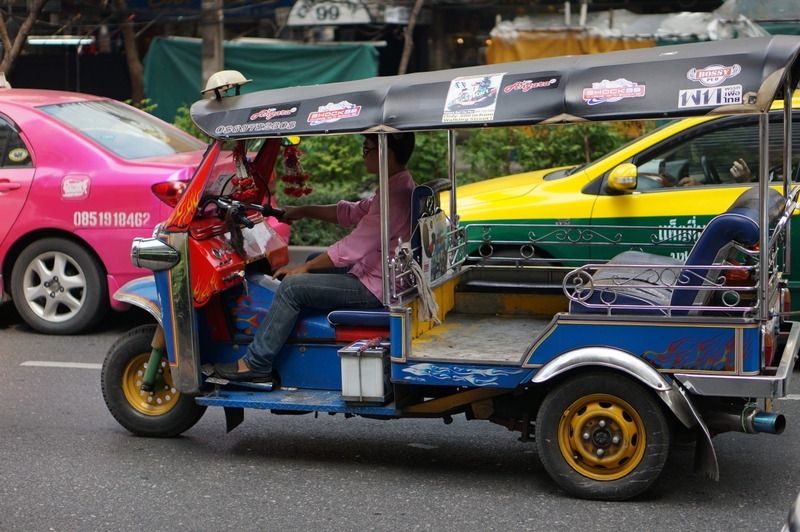 After presenting you the “normal” ways Getting around in Bangkok (I), it’s time to show you the more unique ways of getting around. Tuk-tuk or auto rickshaw is a usually three-wheeled cabin cycle. You can hire them like a taxi. Never ask for a price, otherwise they tell you a fantasy price or take you on a “shopping tour” across Bangkok. Tell them a price that you think is right. When bargaining remember that transportation is cheap in Thailand. A ride across the city with the BTS skytrain costs ruffly 50 Baht. First of all, use this type of transportation only if you want to kill yourself. 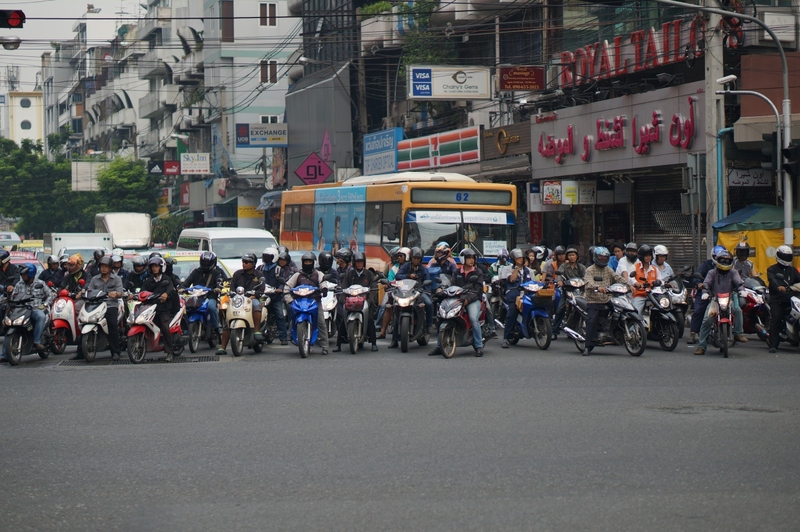 Motorcycle taxis are for short distance journeys. They drive between car rows and there’s basically no safety/protection. 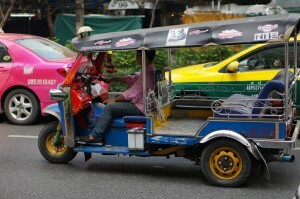 Like with the tuk-tuks, you have to know the fare otherwise you pay the farang price. You can recognise them by the orange vests they’re wearing. 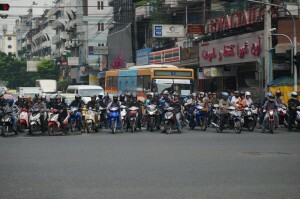 They usually wait in groups near the same shops and restaurants and corners of main streets during daytime. Stay tuned for more upcoming posts about Bangkok and Thailand.